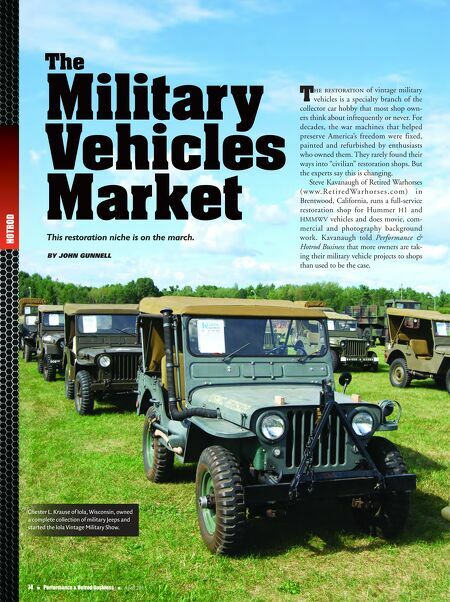 HOTROD The Military Vehicles Market This restoration niche is on the march. 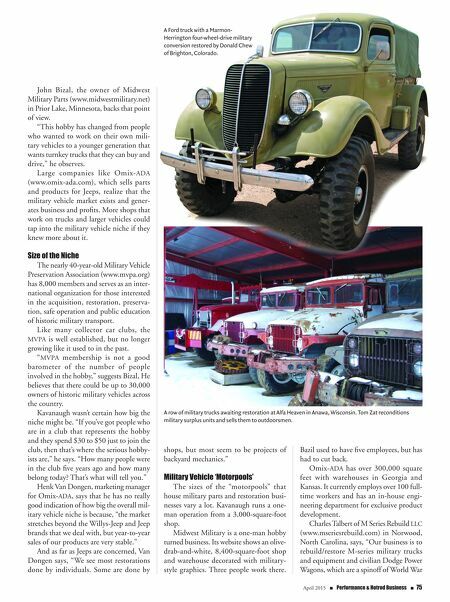 By John Gunnell T he restoration of vintage military vehicles is a specialty branch of the collector car hobby that most shop own- ers think about infrequently or never. For decades, the war machines that helped preserve America's freedom were fixed, painted and refurbished by enthusiasts who owned them. They rarely found their ways into "civilian" restoration shops. But the experts say this is changing. Steve Kavanaugh of Retired Warhorses ( w w w. R e t i r e d Wa r h o r s e s . c o m ) i n Brentwood, California, runs a full-service restoration shop for Hummer H1 and HMMWV vehicles and does movie, com- mercial and photography background work. Kavanaugh told Performance & Hotrod Business that more owners are tak- ing their military vehicle projects to shops than used to be the case. 74 n Performance & Hotrod Business n April 2015 Chester L. Krause of Iola, Wisconsin, owned a complete collection of military Jeeps and started the Iola Vintage Military Show.